It’s been 20 years now since there was a radical shift in drug testing on the world level. American shot putters adapted to the new conditions by developing a fairly new way of throwing: the rotational technique. The results of this by the numbers are pretty evident. Over the last 20 years, the US has captured 32/75 world medals (42.6% of Olympic, World Indoor and Outdoor) and 81/200 top ten world ranking spots (40.6%). Over the previous 20 years(1975-1994) the US had earned 9/39 medals (23%) and 61/200 world ranking spots. Clearly, as the spin technique became better America’s medal production and top 10 ranking spots made a significant increase. 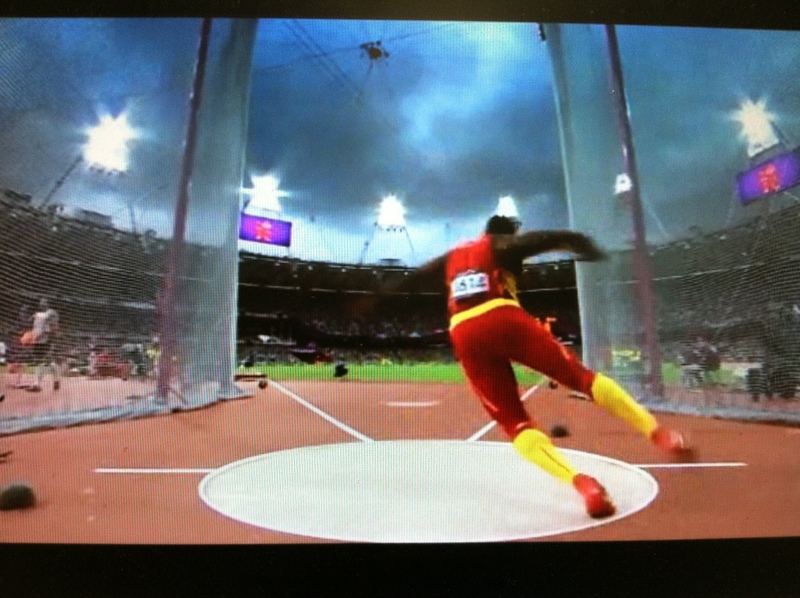 However, our other rotating event– the discus–did not see the same success. I am a numbers guy and a history guy. I coach by recording numbers and watching the correlations between the numbers and the training program. I also have done extensive research into training systems around the world. The history of the sport can also show you the mistakes that are made so you don’t do repeat them, and yes, I love the history channel. Here are the discus numbers for three 20-year time periods. From 1955-1974 we held 84/200 world ranking spots (42%) much like the spin shot has been for the last 20 years and 10/15 world medals (66.6%) . Over the next 20 years (1975-1994) those numbers dropped dramatically: 42/200 world ranking spots and 5/24 medals (20.8%). During the next 20 years (1995-present) we earned 22/200 ranking spots and 1/45 world medals (2.2%). These numbers have always bothered me, so I started looking for reasons why. This would indicate that the raw material for good discus throwing at the upper levels exists in the country, and the NCAA system is still the best minor league for track in the world. 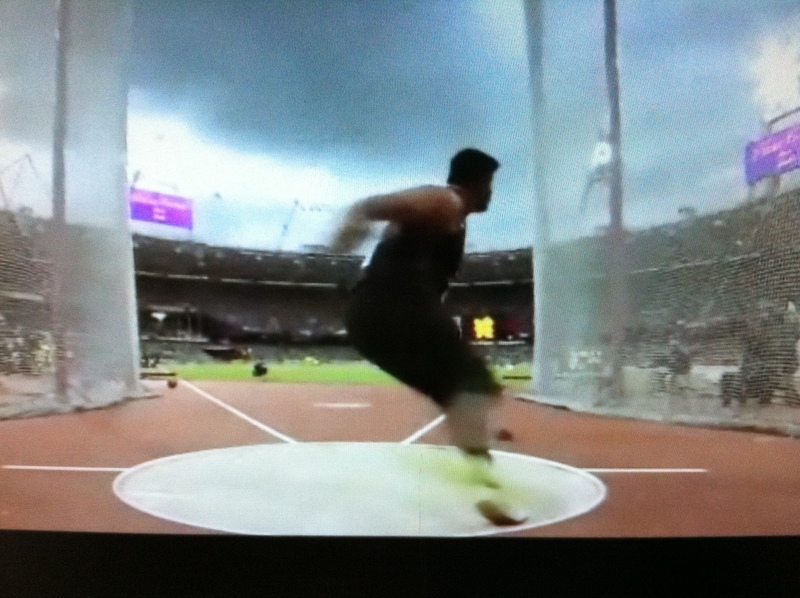 The big question is, why aren’t we producing more world class discus throwers? In the last 10 years we earned 7/100 world ranking spots and a big goose egg on medals. 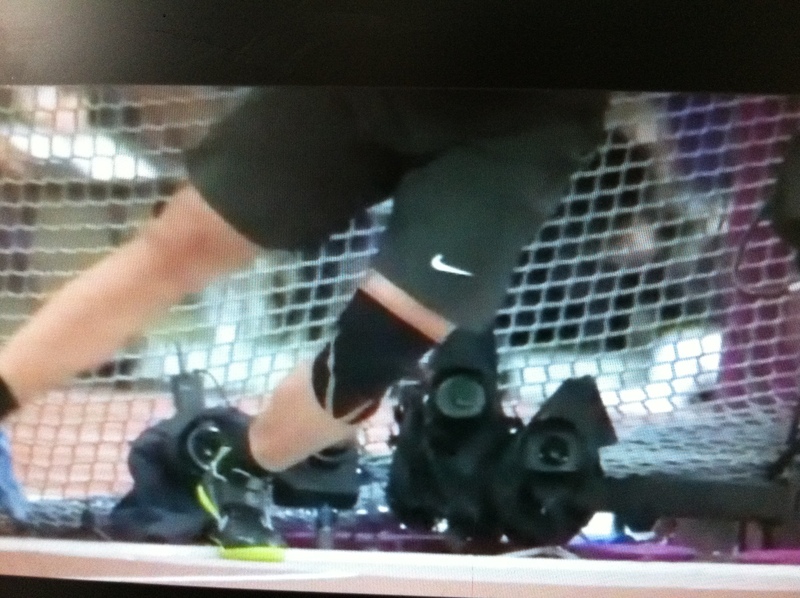 This is what I think happened in the last 20 years in the discus in America. When the 200-237 foot high schools throwers tried to step up to the 2k something was missing. 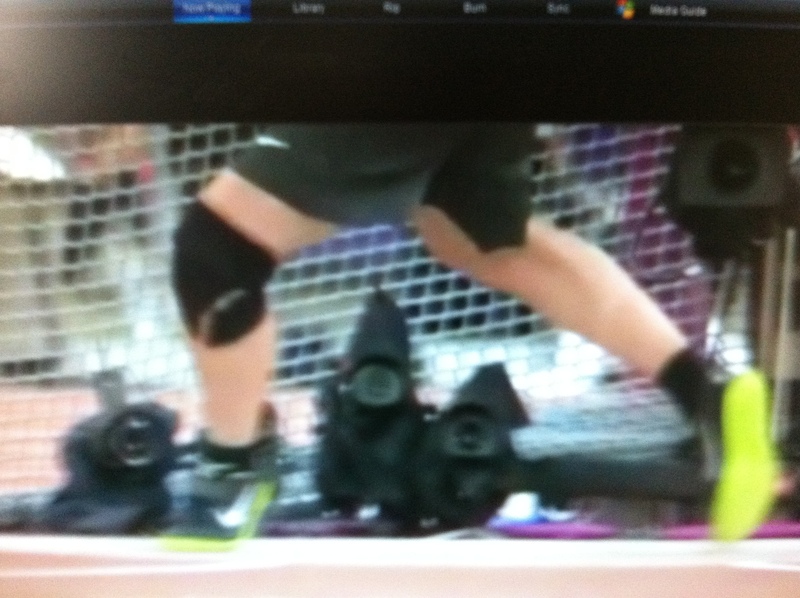 We can rotate well, because we have all these spin shot putters so what is it? Is it technique like many say, or is it something else? If it was solely technique, then we wouldn’t have all these high school guys throwing so well. What we need to do is to focus on throwers with a large wingspan and specifically train them with under and overweight implements and special throwing tools at higher volumes. This is how we are getting beat in this event. 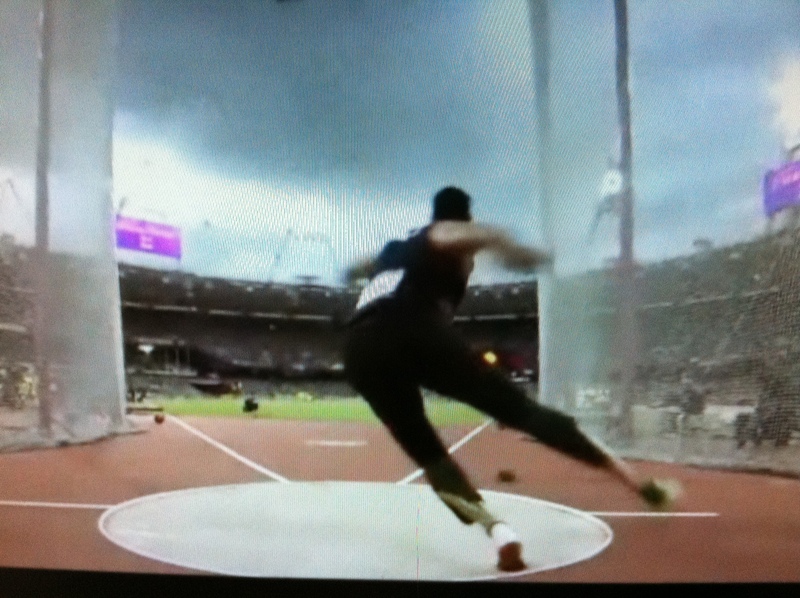 Americans mostly right now throw the 2k and lighter for our training with a low volume of throws. We need to be throwing heavy discs up to 4k and even heavier devices like the one Perkovic throws that was developed by Jerry Clayton. We need to focus on this area and stick with it. This is a long term approach that pays down the road. When the heavy implement goes further and the light implement goes further than the middle implement, the 2k will go further. Just throwing a 2k or a 2.25k will not get the job done. This is a 10,000 throws a year training regimen that has to be programmed, recorded and monitored for each athlete at the elite levels. The Europeans know if we don’t take that many throws and we don’t throw that heavy as part of the training that we have no chance unless we come up with our own freak of nature. 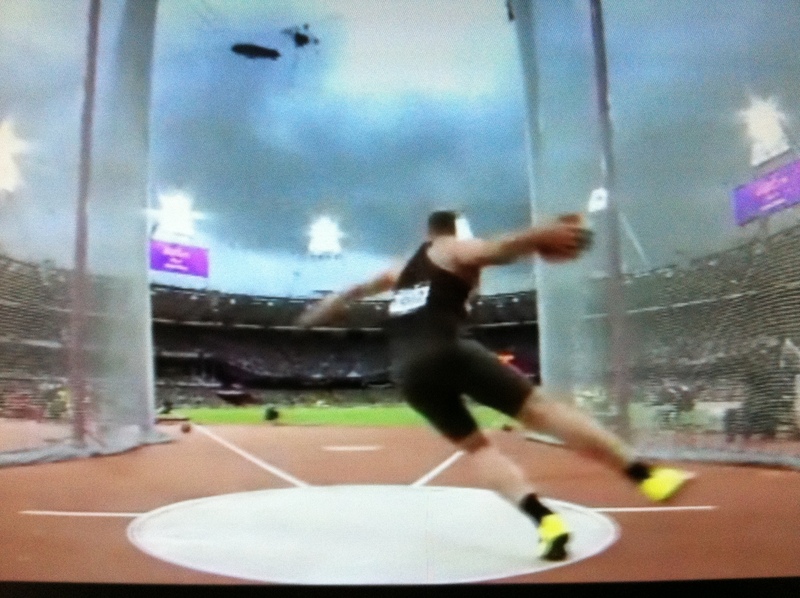 The last part of this is a large amount of discus training has to be centered on non-reverse throwing. This doesn’t mean that I am saying never to use a reverse, but a high amount of throws need to be taken non-reverse for proper leg development. 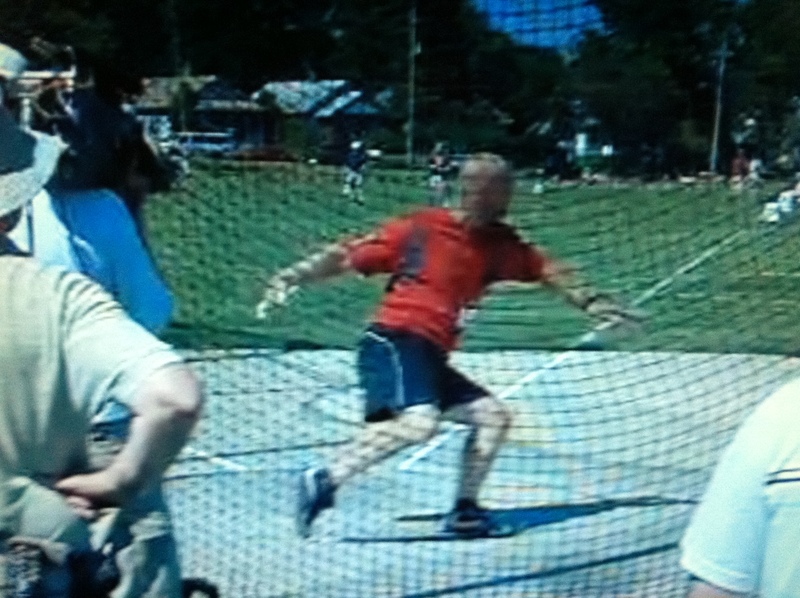 Discus throwers technically need to learn good mechanics working against the ground. This has to be introduced early during a thrower’s high school days as it takes many repetitions to reap the benefits of this approach. This would represent a major philosophy shift in this event, but what we are doing now clearly does not work. When the drugs got scaled back, the Europeans adapted in the discus and we didn’t. We adapted with the rotational shot and they didn’t. I ask you, is there a better way to ward off the winter blues than to spend an afternoon dissecting great discus technique? Okay, there probably are better ways, but this one is cheap, fat free, perfectly legal and will help me forget about that three-foot snow drift covering our discus ring. So, here goes. Warning: If you can identify the owner of these legs you probably spend way too much time watching throws videos and are in danger of being called a “super dweeb” by your long-suffering wife. Trust me, I have experience in this matter. Anyway, these pairs of photos illustrate two important stations along the path to a fine throw. 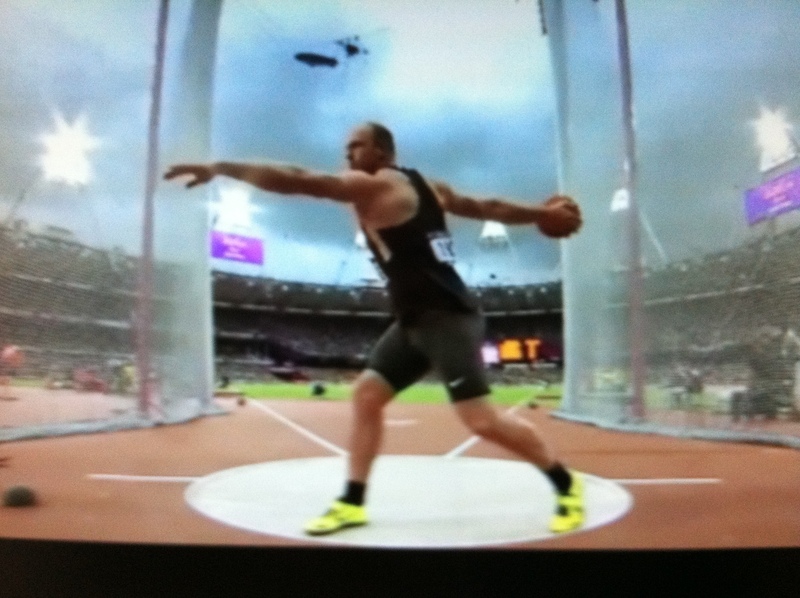 The athlete must begin with a balanced windup: right foot flat, left heel up, left big toe in contact with the ground. The second photo in each set depicts the athlete in an excellent position to run the ring: right leg wide, weight balanced on the ball of the left foot, discus trailing behind the right hip. 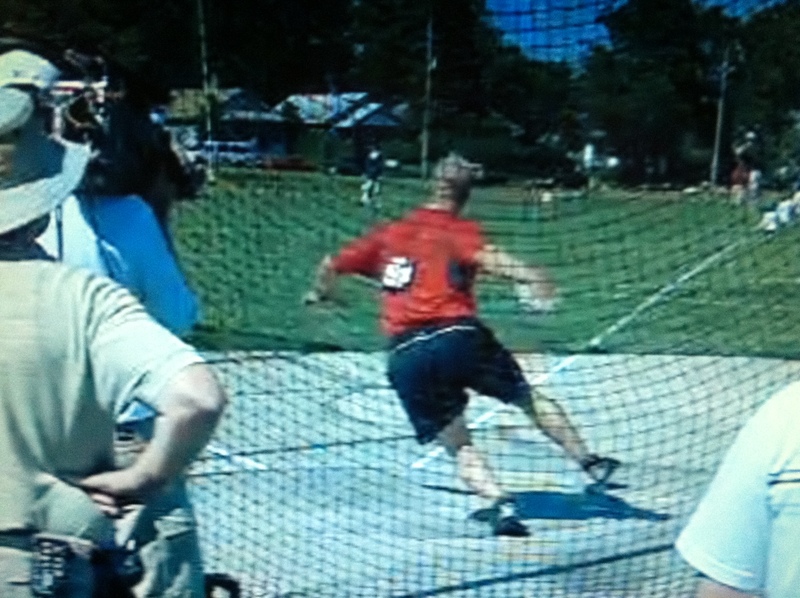 If you watch these throwers (Frank Casanas, Casey Malone and…..???) on film or in person they make moving through these positions seem perfectly natural, but if you coach young athletes you know how difficult this transition can be. 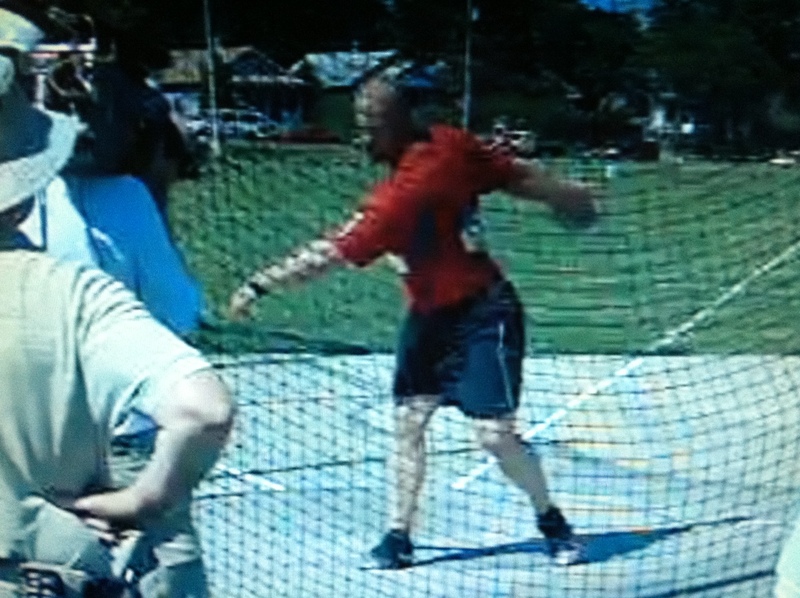 Beginning throwers tend to unwind by pulling with their head and left arm. 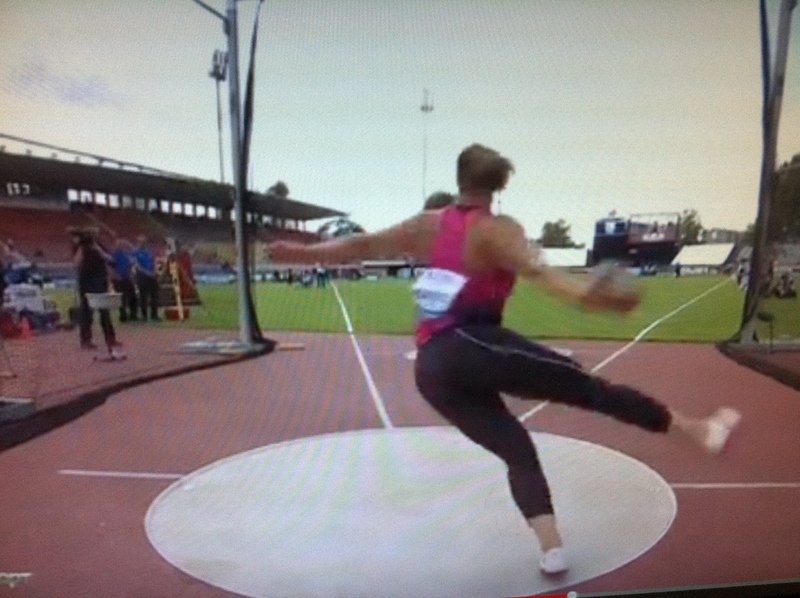 This causes the discus to jump ahead of the thrower and makes it impossible to get the right leg out wide because the thrower will feel (quite correctly) that he will fall down if he doesn’t get that right foot back on the ground quickly. 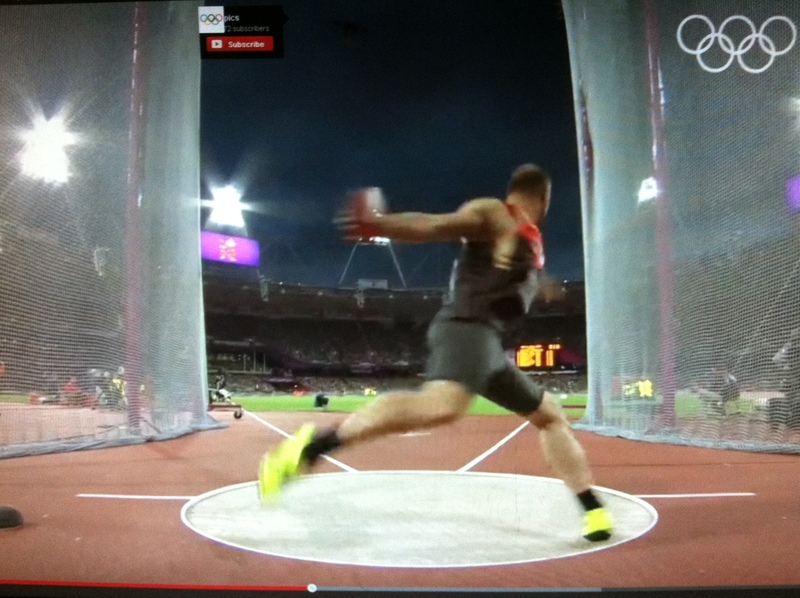 It seems that among the best discus throwers there are two approaches to moving from the windup to the balanced, “ready to run the ring” position. 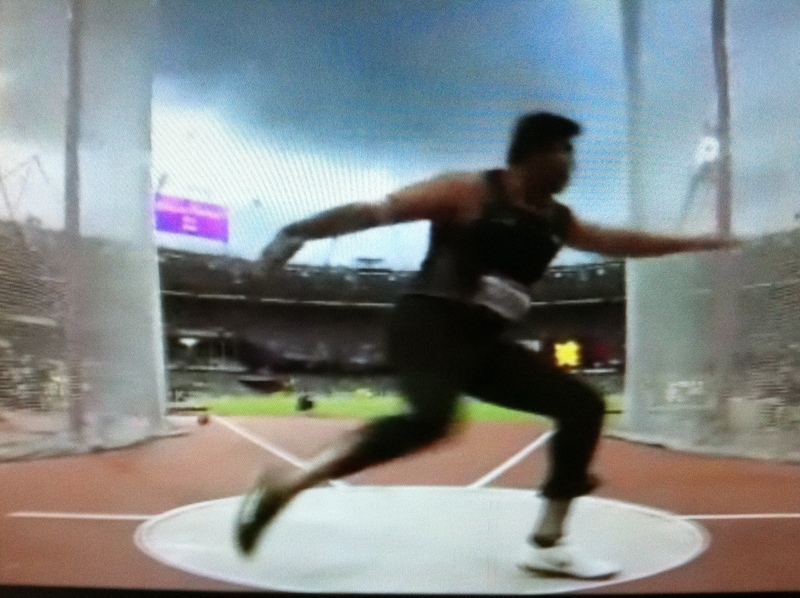 Some throwers try to get their right foot off the ground and sweeping ahead of the discus as soon as possible. When the left foot pivots 90 degrees to the left, they want that right foot up and moving. This is Vikas Gowda. As you can see, his left foot has turned 90 degrees and his right toes are leaving the ground. By the time his left foot has turned to where it is pointing down the right sector line, his right leg is already sweeping past it. 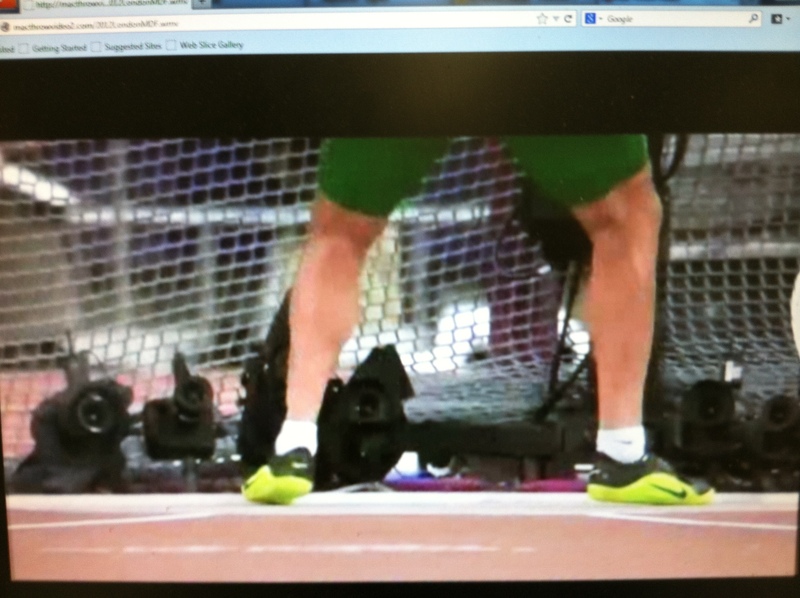 The right leg then continues to sweep out wide with the disc lagging behind. At this point, he is in great shape to run the ring. Here is Casey Malone, demonstrating the same “get the right leg moving early” approach. The other method of transitioning from the wind to the “ready to run the ring” position is to leave the right foot on the ground longer while turning and getting way out over the left foot. If you can identify the owner of these legs, you are a bigger dork than me even, but you won’t have to worry about your wife getting mad at you because you likely will never have a wife. As you can see in the middle photo, this thrower keeps his right foot grounded much longer than the throwers in those earlier photos–beginning his right leg sweep only after his left foot turns to point down the right foul line. I suspect that the advantage of leaving the right foot on the ground longer is twofold. First, it may make it easier to remain on balance while the thrower shifts his/her weight far to the left–a shift that is essential to getting in position to run the ring. 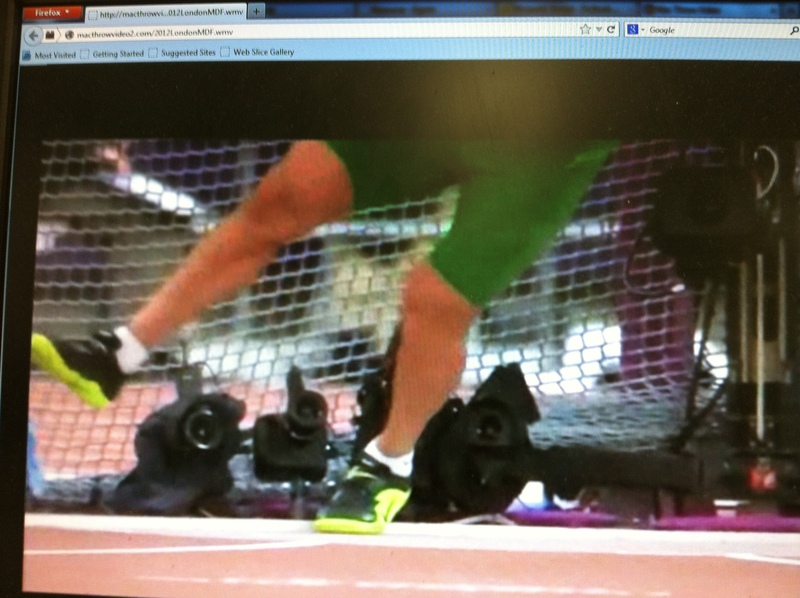 Second, leaving the right grounded while shifting way out over the left leg may create some elastic tension in the right leg that, when released, adds extra impetus to the right leg sweep. I have experimented with this style the past couple of years, and some of my athletes have become quite comfortable with it. One warning though. 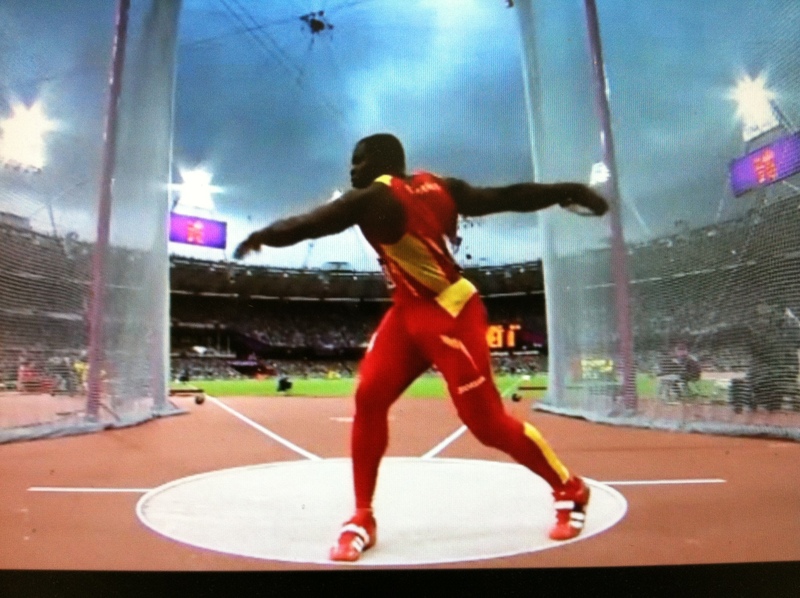 If you attempt to teach this method, you must constantly drill your athletes to keep the discus back as they shift out over their left leg because with the right foot staying grounded longer it is very easy to let the disc sneak ahead. We are due for another snow storm this week, so stay tuned for part two of Harting v. Perkovic. 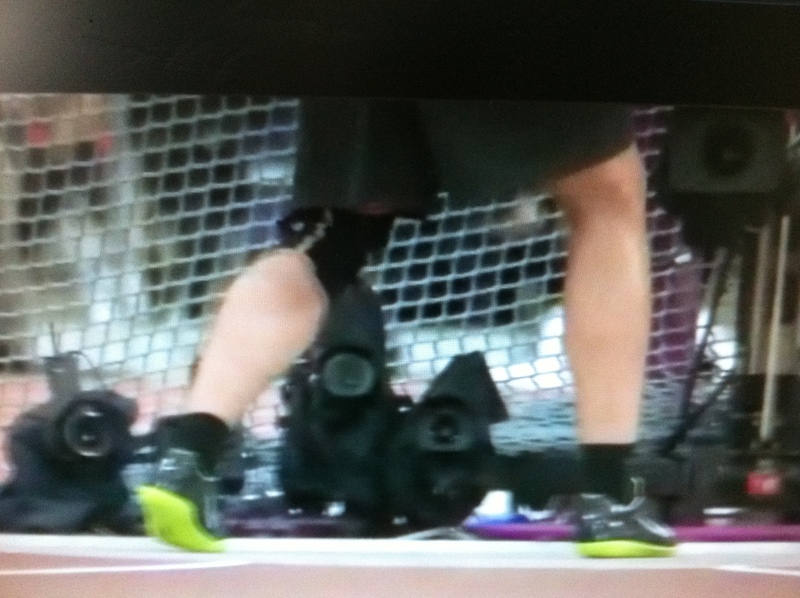 Any guesses on the owners of those legs?